2017 was the breakthrough year for RPA deployments. While it’s true that many enterprises were (and still are) struggling to build their business case for RPA, many others managed to pilot it successfully and transition promptly to full scale rollouts. We were very fortunate last year to play the leading role in one of the largest Enterprise RPA projects deployed to date. In addition to the codename "Firefly," we also nicknamed our 2018 release “The 10K Release”. Besides having a particularly exciting ring to it, like the title of a heavyweight boxing championship, the ‘10K’ label marks for us the culmination of our continuous efforts to build an enterprise-grade platform that is not only the fastest to implement, but also powerfully scalable and easy to manage in a secure and reliable environment. In 2018, UiPath comes readily configured for large scale deployments. How large? Over 10,000 Robots operating at the same time. Tried and tested, these shouldn’t be dizzying heights for RPA adopting companies. Thousands of automated processes in production represent the sensible threshold for what we should soon consider to be accomplished Enterprise RPA projects. We also came up with new ways to simplify large scale operations management. 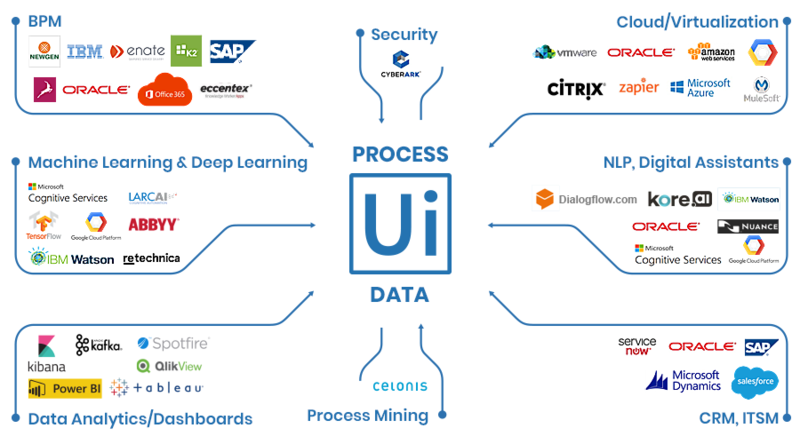 The UiPath Orchestrator Enterprise Edition features machine learning-based monitoring and alerting supported by Elasticsearch. Now you can spot operational, business, and security issues as they happen and take action quickly. And to make Robot set-up easier, especially for large deployments, you can now control your Robot’s settings across all workstations from a single central location. This will prove very helpful for troubleshooting. If a process doesn’t work as expected, you can adjust it from the distance. Our Robots are still the most secure, so there wasn’t much to improve here, although we did a thorough clean-up of all minor vulnerabilities and added an extra layer of control and defense by tightening password management and the access to Orchestrator to better separate privileges and track changes securely. You know that last year we introduced multi-tenancy, which makes it possible for multiple business groups to work separately and securely on the same RPA project. What you probably don’t know is that we now integrate Elasticsearch XPack, an extension which brings additional security features for access control and builds a shield around the data stored in the Elastic Stack. It will prevent unwanted users from accessing RPA analytical data and logs, nicely complementing multiple tenant environments. Along with this release we also provide expanded integration with CyberArk, further ensuring compliance and non-repudiation. CyberArk is the preferred security software technology of more than half of the Fortune 100 companies operating in the financial services, energy, retail and healthcare markets. Since we brought it to the RPA industry last year, more RPA vendors have started using it. And that’s a good thing. There is a tremendous amount of digital transformation heading your way and RPA will become a key part as you transition to AI. Fully consolidated into our platform is now a complete solution to automate semi-structured sources of data. Infused with Intelligent OCR, our bots can now automatically interpret, process and classify non-standard documents and forms. These can be invoices, contracts, medical forms, or any other type of document with a variable layout. It’s going to be plain sailing for automated comparisons of bank statements, national ID verifications or payslips for loan approvals. All of this is achieved in a single integrated platform, with machine learning in the background training the Robot to remember different document layouts and automatically match new ones against them. If your business processes millions of invoices of hundreds of thousands of different types every month, this will do the trick beautifully. Think of it as a cognitive implant, embedded directly into your mission critical workflows to achieve higher forms of automation. The challenge of greater automation is a question of end-to-end processing. This year we will continue to embed AI building blocks that will ultimately empower your bots to perform probabilistically and make dynamic decisions. UiPath 2018 is the first Enterprise RPA Platform featuring pre-built, drag & drop, tight inbound/outbound integrations with our technology partner ecosystem. Live, now, is a full blown API that allows you to build custom integrations of any external DCM, BPM or CRM solution within the Orchestrator. You can trigger a Robot via DCM and BPM in the same way you would schedule a Robot from Orchestrator. We are determined to grow the most powerful ecosystem of partnerships and technologies around the UiPath Platform. Our newest BPM and Case Management integrations with Oracle Process Cloud Services, Newgensoft and Enate represent very important pieces of that puzzle. Good news! We're ready to share with you a first set of pre-packaged automation solutions built to address popular business and market requirements. These out-of-the box templates and activities are designed to accelerate enterprise automation efforts by over 50%. They include General Data Protection Regulation (GDPR) protecting individuals in the European Union, Know-Your-Customer (KYC) requirements to address risk and fraud in financial services, and Customer Contact Center Automation. With this release we made an elegant move and created the possibility for more users to share a single licence key. And it’s now possible to not only manage, but also activate all licenses, including Studio, from Orchestrator. Details here. RPA operational teams can now easily handle technical and business exceptions by assigning them to a particular user for review. This minimal orchestration feature, what we call the poor man’s case management solution, is especially relevant for large RPA configurations where managing exceptions becomes a critical workload factor. It enables users to assign items like failed invoice transactions to a task manager, add comments to them and have a dedicated reviewer verify each item. Their entire history is fully auditable, so you will know at all times who is in charge of which exception. These are functionalities that exist in BPM and DCM solutions by default, we simply started building some of them into the Orchestrator to offer a basic alternative to the customers that don’t have Oracle or SharePoint. Our customers were eager to explore more possibilities with Orchestrator, so we came up with some new activities to enhance the RPA user’s experience when bossing around Robots. Now you can give them more detailed instructions as they process work and update those instructions for particular scenarios on the fly. See if there are other jobs running for a certain process, check for duplicates, or trigger a new process to start within a current process. Large RPA projects, where the Robots must cooperate to complete different scenarios and juggle a variety of commands will love these new functionalities. Our developers worked on a whole new set of meaningful and ready-to-use RPA dashboards that offer more detailed, out of the box reporting on RPA performance. These are visual reports containing granular information now available at queue level. Exceptions are broken down by class––business or technical––and have all their details logged, including priority level and review status. You can make good, informed decisions based on this oversight, and assign your Robots greater missions. There are many other upgrades and enhancements to read about in our dedicated Release Notes. As our product innovates, it becomes easier and more practical for business users to manage large-scale automations, within an architecture that the IT department can govern properly. Robots are evolving to communicate and collaborate more deeply, and we are cultivating new ways to securely control and deploy your digital workforce at the touch of a button. Artificial Intelligence shouldn’t feel nebulous. We are developing, partnering with and integrating AI functionality into our platform to get you through what might now seem like a journey of cosmic proportions. Luckily, RPA is not only the necessary rite of passage into AI, but probably the easiest one as well. This open systems approach has so far proved very successful for us in bringing new technology to many of our customers and encouraging more partners to join an already thriving ecosystem. One robot for every worker expresses our vision for a not so distant future where automation becomes ubiquitous and enables new methods of working and doing business in the digital world. Offering continuous automation training and qualifications through UiPath Academy, and nurturing what is now already a global community of RPA experts, will take us there together. We concluded 2017 with 700 enterprise customers, a 611% increase over 2016, and a worldwide community of developers exceeding 120,000. So buckle up for 2018 and hear Lavinia, UiPath's Lead Software Developer, give more hints of what is to come this year from UiPath.